Safebrowsing.biz is a search engine that is very similar to esurf.biz, your-home-page.net, houmpage.com, and safesurfs.net the way it acts and looks. It might really seem at first that Safebrowsing.biz is a trustworthy search engine that does not differ from ordinary search tools; however, the truth is that Safebrowsing.biz cannot be trusted at all. You will find out why specialists do not trust it and even place it under the category of browser hijackers in the article. In addition, you will find out how to remove this search engine. This knowledge will be useful if you decide to remove Safebrowsing.biz from your Internet Explorer, Google Chrome, and Mozilla Firefox browsers after reading the report. First of all, let us explain you why Safebrowsing.biz is an untrustworthy search engine. According to specialists at pcthreat.com, this search engine is harmful because it might expose users to malicious software. Of course, nothing bad will happen if a user does not use the search box to find the information on the web. Unfortunately, the majority of users do not even suspect that it is dangerous to search for the information on the web using Safebrowsing.biz, so they enter search queries into its search box without any fear. We cannot say that search results Safebrowsing.biz provides are very bad themselves; however, it has been noticed that advertisements and untrustworthy third-party links might be hidden among the legitimate-looking Yahoo! search results. If you click on any of them, you might end up on a third-party website that is untrustworthy. What is more, specialists say that you might be redirected to another website if you click on buttons placed on its main page. Yes, they should take you to eBay, Twitter, Facebook, Amazon, and other popular websites; however, a slight possibility that the route will be changed still exists. Yes, we want to convince you to delete Safebrowsing.biz browser hijacker from your computer as soon as possible. Researchers say that this hijacker might modify the shortcuts of your browsers, so do not be surprised if Safebrowsing.biz revives after you remove it. Do not worry; it is still possible to eliminate this untrustworthy search engine permanently. Most probably, you see Safebrowsing.biz because you have downloaded the software package from the web and installed it without paying much attention to the installation window. In most cases, users download such bundles from P2P websites, and they do not even know that they will allow malware to enter their computers instead of installing a single free application, e.g. a PDF converter. Do you often download free software? If so, we suggest installing security software on your PC. It will make sure that undesirable software cannot sneak onto your computer together with free applications. Users should be more careful in the future as well, for example, they should always download free programs from their official websites. It will not be very easy to remove Safebrowsing.biz from browsers because it modifies the shortcuts of all the browsers. In addition, it does not have an uninstaller in Control Panel. Do not worry; our manual removal instructions you can find below will help you to erase the browser hijacker. You simply need to follow the manual removal instructions step by step. If you find it too difficult, download the scanner from our website, upgrade it, and scan the system with it to remove all the threats that hide on your computer and do various activities. Right-click on the shortcut of your browser. 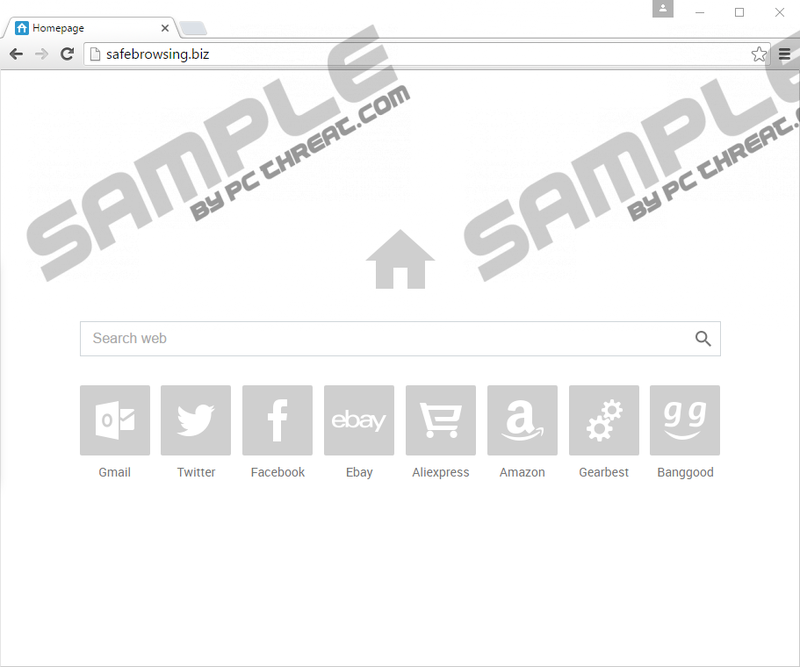 Remove the address http://Safebrowsing.biz from the Target line. Check the Delete personal settings box. Select Settings and then open Show advanced settings. Click on this button again when you notice a dialog box. Quick & tested solution for Safebrowsing.biz removal.